Public transportation passengers are a classic example of what in "marketing communication" terminology is described as a "captive audience". 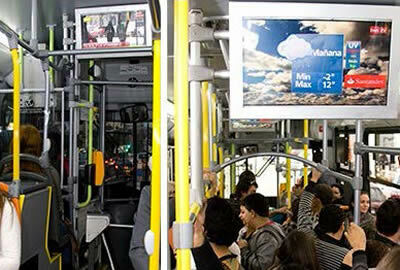 Any public transportation company - trains, trams, buses, taxi's, limousines etc - can now deploy a state of the art on-board Digital Signage System that keeps track - based on the renowned Navori QL software platform. Traditionally public information, as well as product promotions, are broadcasted in a simple loop. The more signage content that is dynamic, the higher the audience catch rate. Navori QL is the platform of choice for any Automotive Digital Signage project because of its flexibility, ease of technical integration coupled with the additional benefit of scoring the lowest OPEX (operational costs) ratio in the market. Real time information such as latest news feeds or (local) weather information can be included, all in full HD broadcast TV quality. Command and Navori's transport solution is suitable for all types of industries.